Mmm, a manual, rear wheel drive wagon that never made it to the states? Perfect. Having owned E30 coupes, convertibles and sedans, it was time for something new and different. For us, that meant a wagon. no cracks on the dash? what? 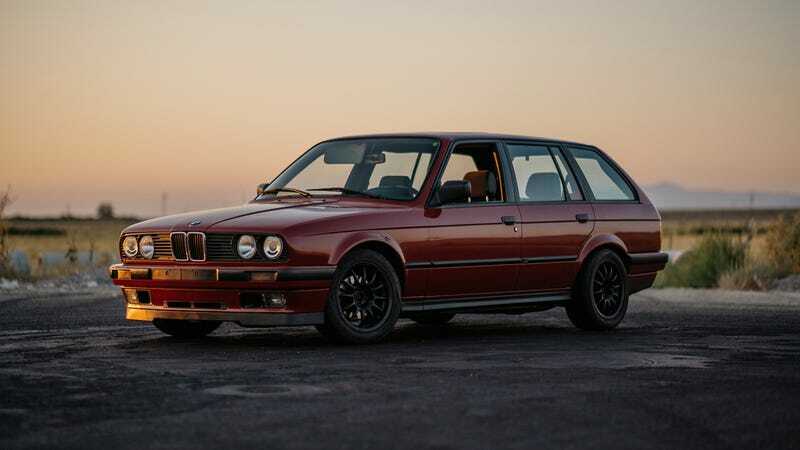 Nico worked his European magic, spreckened some Deutsch, and we had a brilliantrot 1989 BMW 318i touring (aka a bright red E30 wagon) heading over in a shipping container. The car was fun to drive stock - and before you say it, yes, the motor is tiny - a 1.8L 4 cylinder (m40b18) motor pumping out 113 horses when new… But that “connected to the road” vibe is so different from modern cars that you feel as if you’re piloting a road legal go kart. These cars are little more than a steering wheel, gearbox, motor, pedals and brakes. We took it for some drives and quickly learned its weak points. Old bushings, sloppy handling from worn struts and springs, an exhaust leak, and of course, a massive lack of power. But you know what was great about it? We didn’t go the cheap route with a UK import, so we got LHD and all the ease of driving and modification that comes with it. The interior was mint aside from a tear in the front seat, and the rust was manageable. rust was confined to the fender, which is easily removable. We updated everything under the car - new rear diff (3.73 LSD,) control arms, sway bars, bushings, suspension and lightweight 15” wheels and grippier tires. The beautiful thing about E30s are that parts are plentiful, whether it’s OEM or aftermarket. We researched and planned - E30s are essentially life size legos for adults. What kind of motor do you want to drop in there? Inline 6 from an early 90s 3 series? V8 from a mid 90s 5 series? LS motor? (don’t tell the purists) 2JZ?? V12 from a 7 series with a turbo thrown in for fun??? It’s all been done at some point, and most swap parts are available from companies that specialize in stuffing inappropriately large motors into such a small car. When an S50 popped up in the local classifieds, we knew what had to be done. We picked up the motor, an inline six from a 1995 BMW M3, and got to work finding the extra parts we needed - an oil pan from an e34, motor mounts from an e28, driveshaft from an e36 and a few custom parts you can buy online. It took us a few days, but we got the motor in and were driving before we knew it. Was this it? Had the car reached its final form? Doesn’t matter, honestly. That’s the beauty of E30s - they’re fun no matter if they’re stock, lightly modified, or gutted, caged and boosted. Just gotta decide how dirty you want to get your hands. As for us, we’re happy with our little 240hp, rear wheel drive, manual wagon. No traction control, no ABS, no power steering, no AC. Just a steering wheel, engine and a seat. We modify (& sometimes import) vintage euros on our youtube channel, Salt City Euros. What Do You Want To See In An Automotive Show?